The new mob 'an invading gnoll pup' also drops this item. These mobs spawn at the Western Wall near the Plane of Knowledge portal book. Concur. Three of them spawn just Northwest of the PoK book and they seem to drop the scalps about 1/3 of the time, so figure on one scalp per spawn cycle. The repop on them is 3m15s. Found one close to halas, stuck up on the wall. I had trouble finding gnoll pups in North Qeynos, recently - there were none to be found in the newbie garden. Blackburrow's static spawns seem the best place to obtain these scalps now. I agree, rare is more like it. 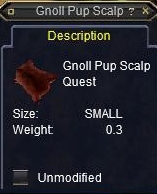 I killed tons of gnoll pups to get 2 gnoll pup scalps.